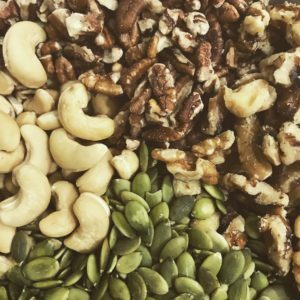 This trail mix is much better than any trail mix in the store! It’s sweet, salty, flavorful, and very nutritious. Makes for a great snack that you can make in bulk. 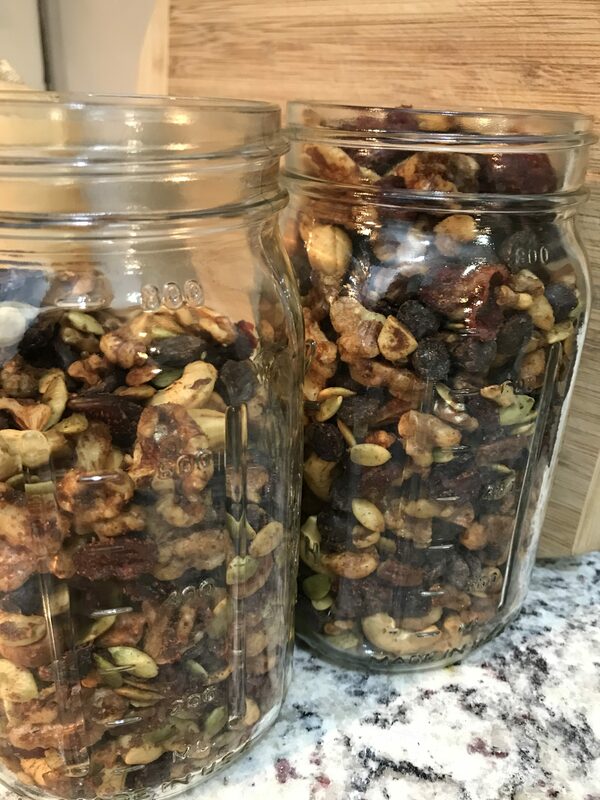 Plus, when you make your own trail mix you can control the sugar content and quality of the fats used. Walnuts – Omega-3’s! This nut has high levels of omega-3 fats and an omega-6;omega-3 ratio of ~4:1 which is just where we need it to be! Cashews – Excellent source of copper. Americans typically aren’t deficient in copper. However, we do need copper for proper iron utilization, anti-oxidant actions, connective tissue integrity and many of us have issues with all of these physiological factors. Pumpkin Seeds – this one is a balanced mineral provider. It’s a very good source of magnesium, phosphorous, copper, and manganese and a good source of zinc and iron. Pumpkin seeds are protein rich for their size providing about 10g per ¼ cup. This isn’t enough to rely on, but it makes a great addition to a building diet! Pecans – Ah the flavor of pecans! There’s no substitute for them. This food is more balanced between nutrients, but it does provide a good amount of protein and phytosterols. Other than that, the pecan has the typical nutrient profile of nuts in general. Make this recipe when you want your house to smell excellent. The slow “roasting” of the nuts in a slow cooker brings out the aromas of the nuts and the added spices. You might want to use maple syrup or honey, however, the trail mix will clump together. You’ll have to stir more often during the roasting process and the result may be a bit sticky. If you’re worried about sugar, use dried sugar only use a bit less than the recipe calls for. The recipe uses ¼ cup per 48 servings which is about ¼ of a teaspoon per serving, and that’s alright even for people eating for blood sugar balance. 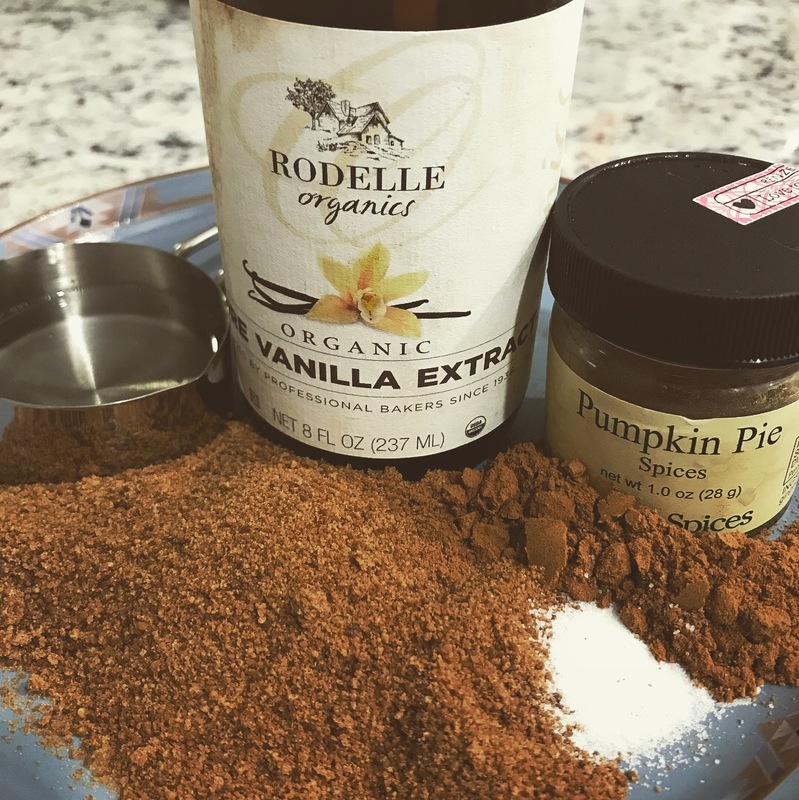 If you don’t have pumpkin spice mix already made, here is my ratio for pumpkin spice. Mix in other ingredients at the end, like chopped, dried apricots; coconut flakes/shreds; carob pieces; or even store-bought, freeze-dried fruit pieces. For salt lovers, add corse salt with the chocolate chips and cranberries. Recipe comes from nutritionist and gluten free specialist Lindsay Cotter and her website Cotter Crunch. Add the nuts/seeds into the slow cooker. Add in the sugar, coconut oil, vanilla extract, spices, and sea salt and stir everything together. Turn the slow cooker on high, cover it, and set a timer for 60-90 minutes. Stir the mixture a few times during this roasting process to prevent one side from getting overly roasted. Once the nuts have browned to your liking, turn off the slow cooker. Lay out the parchment paper (on a cookie sheet to prevent runaways!) and dump the roasted mix onto your parchment paper. Spread out the mix to let it cool a bit and dry. Once the mixture isn’t too hot to melt chocolate, add in your cranberries, chocolate, and other add-ins if using. Mix it all up and it’s ready to eat! Store in an airtight container at room temperature. This was awesome, a really good “travel” snack for long days running errands !!! Thanks!